These large white flowers, sometimes pink with white stripes seem to come from all sorts of different plants, trees, shrubs, hedges and even from electric poles! In fact it is the flower of a climbing plant, the Hedge false bindweed. Considered a weed, this native is less harmful than its introduced cousin the Field bindweed (Convolvulus arvensis), because we find very rarely the Hedge false bindweed across cultures. 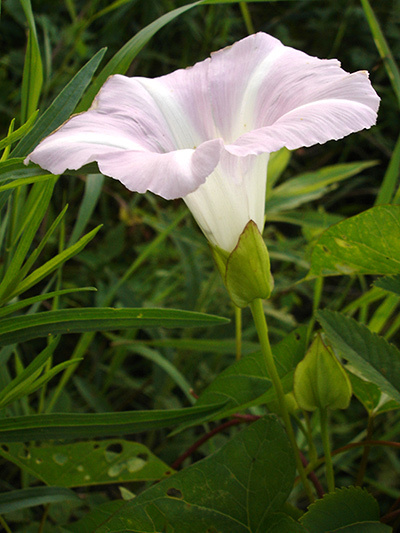 Some botanists consider this plant as a semi-perennial because the Hedge false bindweed is renewed in the spring either by seed or by the stem that does not just climb, but also goes down, and then a part of the stem goes in the soil and form a tuber, tuber from which will spout up new shoots in spring.